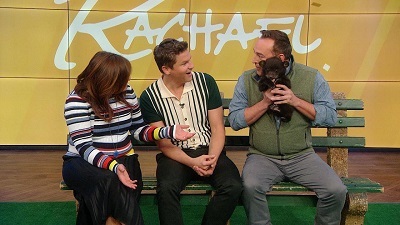 Neil Patrick Harris' better half, David Burtka, is Rachael's co-host for the day — and it's a party all hour long! David serves up chicken enchiladas, and we've got some literal party animals in the house. (Seriously, we're not monkeying around!) Then, top celebrity wedding planner Marcy Blum shares her DIY ideas for personalizing your big day. Plus, meet an empowering female street artist who is inspiring women everywhere — including in our studio. And Rachael's making a 30 Minute Meal: Spanish Shrimp Scampi and Rice.